" The Signal Sweetener Pro-Sound II was designed for a person using a pot volume pedal with a steel guitar. 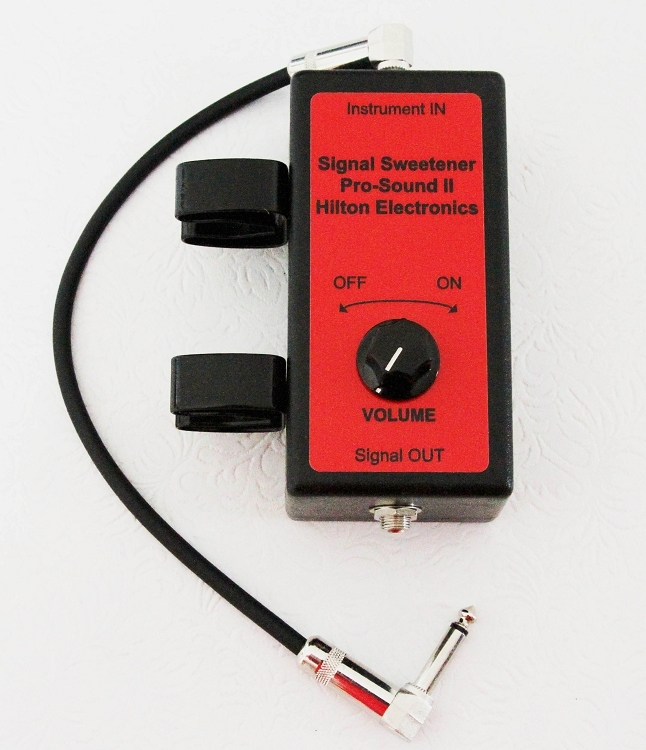 The Signal Sweetener Pro-Sound II is an updated, and improved, version of the world famous Hilton Digital Sustain Unit. 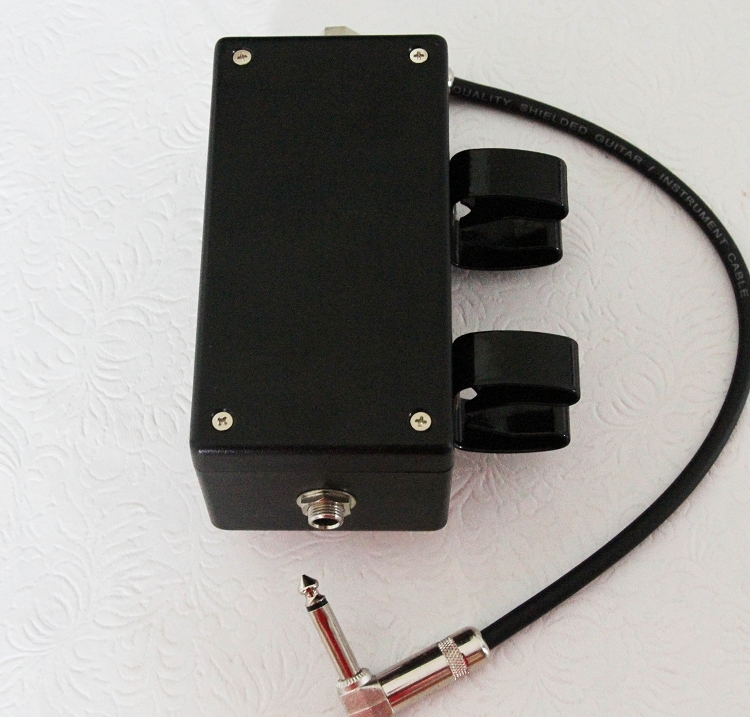 This new device is designed to improve the tone-frequency response of traditional pot volume pedals. The tone-frequency response of a pot pedal is not the same at low levels as it is at higher volume levels. The capacitance in an old pot pedal robs the high-end frequency out of a guitar’s pickup signal . This is why when using an old pot volume pedal your sound is better, or worse, at lower or higher volumes. With the Signal Sweetener Pro-Sound II, your pickup becomes more alive, and the frequency response more consistent. The Signal Sweetener Pro-Sound II gives your guitar a much broader, and more transparent frequency range. Guitar notes become much clearer, and more defined, especially at the higher frets. When playing chords, you will hear more string separation. The Signal Sweetener Pro Sound II allows you to keep your old pot pedal, and still have all the high fidelity of the electronic volume pedals. 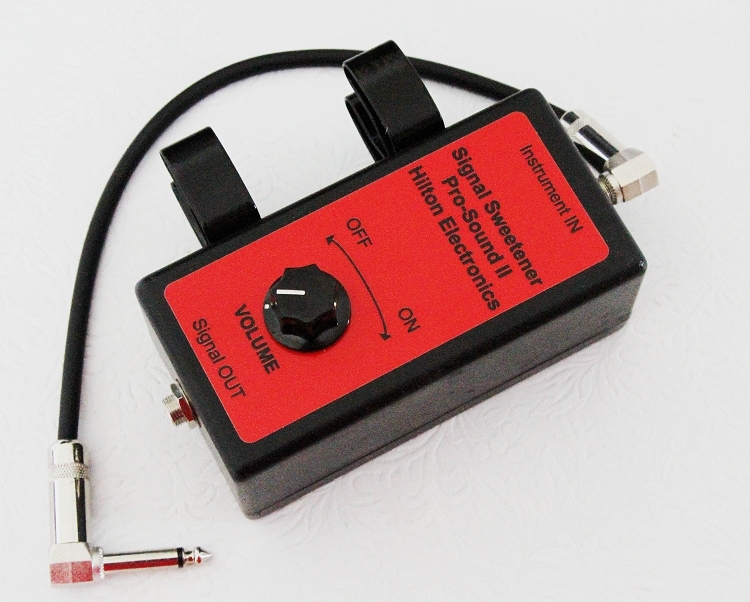 The Signal Sweetener Pro-Sound II is powered with one 9 volt battery. It is simple to operate. One control knob turns the unit on and off. It also controls the signal output. Why is the Signal Sweetener Pro-Sound II better than any other pre-amp for a steel guitar? The answer is simple. It is new improved electronic technology. The other steel guitar pre-amps use outdated technology." 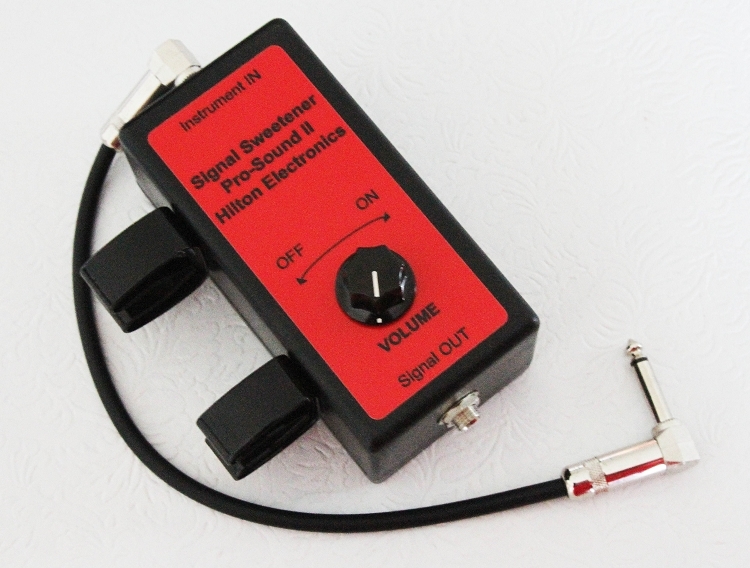 The newest version of the Signal Sweetener has included a plug in for a 9 volt negative tip regulated power supply that I have listed in the hilton accessories. This unit may also be powered by one 9 volt battery if you choose not to add the 9 volt power supply you may power the unit by a 9 volt battery.